In Plautdietsch or Low German, a language used among Mennonites for more than 500 years, there’s a saying: Daut klaupt aules. Meaning everything claps. In English we say everything clicks to describe such a state of convergence. Monday’s International Class at Sogetsu Kaikan was like that. I was given no choice of flowers as they came as a pre-ordered set for Lesson 4.5 A Variety of Materials. 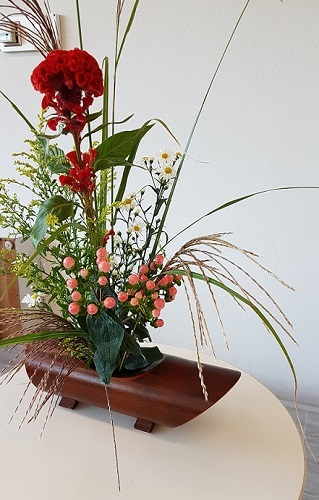 The challenge was to combine more than five elements, mainly flowers, in a single arrangement. The ideal is to show fullness while maintaining space. The arrangement must be colourful but harmoniously so. The container, too, is a significant part of the desired aesthetic. Though I had chosen a container, sensei suggested that I might also look among the baskets in the outer room before starting as the desired softness of the theme might be better realized with a woven rather than a ceramic container. 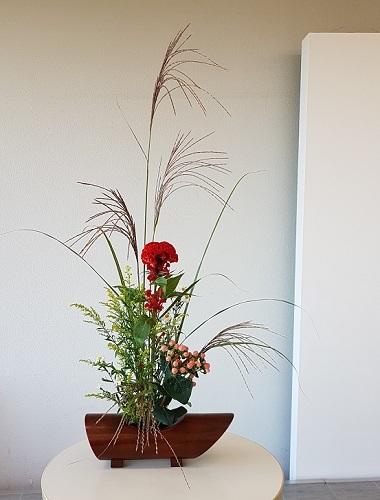 That suggestion meant that buried under the baskets, as if meant to be, I discovered a stunning bamboo container bold enough to balance the single, scarlet cockscomb. From there on in everything else clapped, too. The flowers appeared soft and light as they were meant to. The desired space and depth and asymmetry worked without hassle. That’s often a challenge when the materials succumb to gravity and won’t hold their place. Sensei was pleased and suggested only a few minor tweaks—adding another stem to reinforce the depth, removing a few leaves. It was one of those successes I wished had happened at home in order to enjoy it for several days. It broke my heart to take it apart. Mono no aware. The pathos of things. This entry was posted in Ikebana, Japan, Travel & Culture, This & That. Bookmark the permalink.